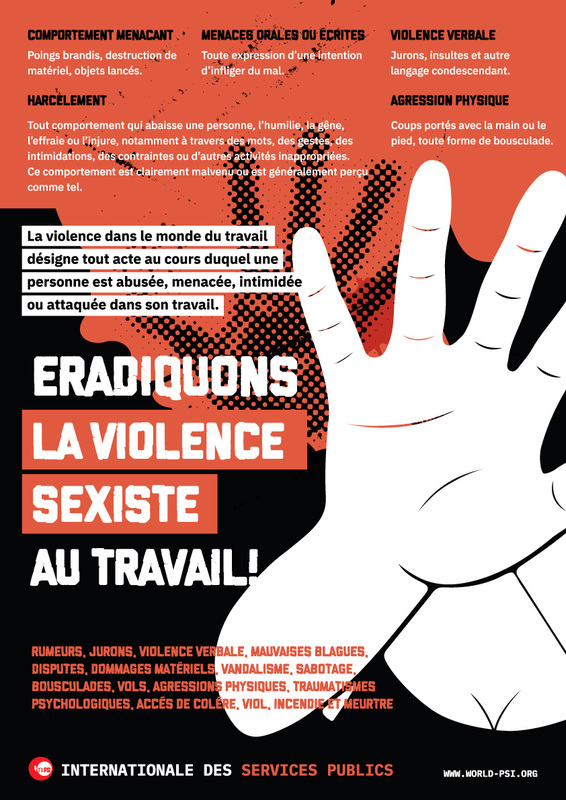 10-03-2019 - The ILO has released the "Ending violence and harassment in the world of work” (Blue Report) available for download in English, French and Spanish on the ILO website as follows: Report V(2A) and Report V(2B). Report V(2) is published in two volumes. Report V(2A), has been prepared on the basis of replies received from governments and employers’ and workers’ organizations, and contains the essential points of their observations. Due to a logistical problem, a few replies that were sent within the deadline of 8 November 2018 have not been included in the present report. In order to avoid delaying the publication of the report, the Office will issue an Addendum with those replies. Report V(2) is published in two volumes. The present bilingual volume, Report V(2B), contains the English and French versions of the proposed texts of the Convention and Recommendation, amended in the light of the observations made by governments and by employers’ and workers’ organizations and for the reasons set out in the Office commentaries in Report V(2A) - to be published by 11 March. PSI Asia Pacific Campaign Toolkit: Advance Labour Rights! End gender-based violence. 03-10-2018 - Solidarity Through Diversity: no discrimination, no exceptions. 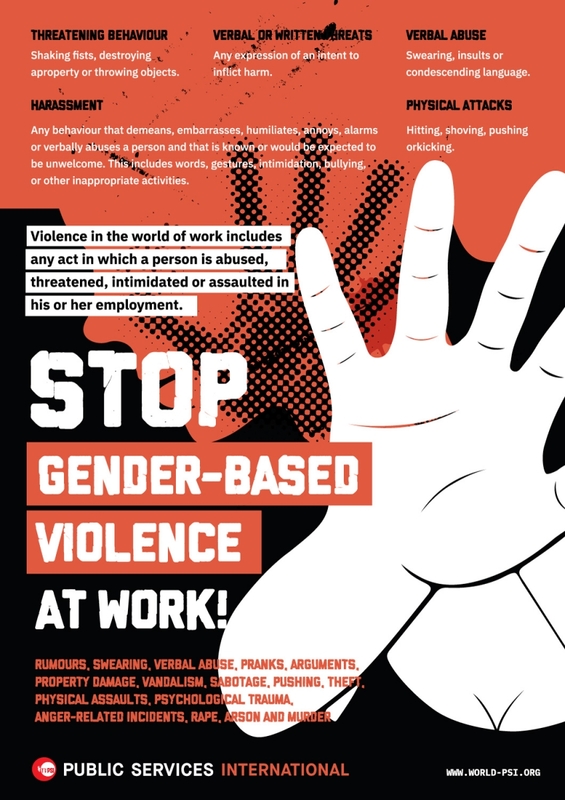 No to violence and harassment in the world of work. Speak out against discrimination, inequality and violence and harassment by sharing ITUC infographics below on social media or producing and circulating your own infographics to show our strength through our diversity. 02-10-2018 - The International Labour Conference (ILC), to be held in its centenary year on 10-21 June 2019, will take a decision on the new Convention and Recommendation on Violence and Harassment in the World of Work. Governments have up until 8 November to send their amendments and observations on the draft Convention and Recommendation prepared by the ILO Office in its recently released Brown Report. 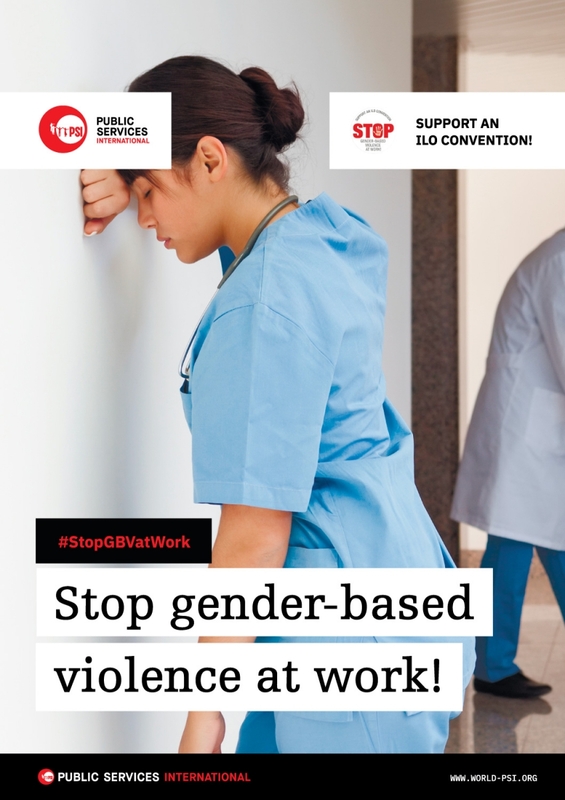 PSI presented its priorities to the discussions on violence and harassment in the world of work at the ILC’s Standards Setting Committee in 2018. PSI is now calling on its affiliates to lobby their national governments to ensure that crucial text be included in the replies that member states must submit by November. 04-06-2018 - A Convention supplemented by a Recommendation was approved in the Standard Setting Committee: agreements on Violence and Harassment in the World of Work. The Committee adopted the draft resolution to place an item entitled “Violence and harassment in the world of work” on the agenda of the next ordinary session for the second discussion with a view to the adoption of a Convention supplemented by a Recommendation. 28-05-2018 - The Standard Setting Committee: Violence and Harassment in the World of Work saw heated debate, with employers and some governments expected to oppose attempts by unions to push for an International Convention on the subject. Read more and listen to PSI's intervention. The ILO yellow report is out! Read carefully the report and proposed conclusions. The report will form the basis for the first discussion at the ILO Conference in June 2018. Fifty governments have already indicated support for an ILO Convention and Recommendation! But our work is far from over. We need to keep lobbying to ensure more government support, as well as to keep the support we have so far. For more information, check the global map on the ITUC campaign page. Between 14 February and 8 March, unions in more than 50 countries, including the Global Union Federations and their members, responded to ITUC’s call for action in support of an ILO Convention and Recommendation to eradicate violence and harassment, including gender-based violence, from the world of work. Check out the ITUC Storify page and photo album. Whilst both women and men experience violence and harassment in the world of work, unequal status and power relations in society and at work often result in women being far more exposed to violence and harassment. Violence against women creates and prolongs inequality, affecting the well-being of current and future generations. Violence and the threat of it deprives women of their basic human rights. There is currently no internationally agreed law that deals with the many different forms of gender-based violence in the workplace! An ILO Convention and Recommendation would send a strong message that violence is NOT part of the job. It would help to give workers a voice to stand up against gender-based violence, and negotiate collective agreements that address GBV. Ending violence against women is a top-priority for PSI. Trade union leaders, specifically male participants, at PSI's Congress in November, pledged to end violence against women including actively supporting campaigns against gender violence and to bring about gender equality in the home, workplace, community, economy and all institutions including the union. It is not too late to sign the pledge! Globally, violence in the health and social care sector is widespread and constitutes at least 25% of all violence at work. Studies as well as anecdotal evidence from health care workers in PSI’s global family demonstrate vividly that while both men and women in the sector suffer from all forms of violence, the power relations in society that see women as second-class citizens, translate to the reality that women health care workers are especially targeted. PSI fully supports the ITUC campaign for this new international labour standard and invites all affiliated unions to join the campaign. Your mobilising, organising and lobbying is critical to build and ensure governments’ support for an ILO Convention and a Recommendation at the ILO Conference in June 2018. 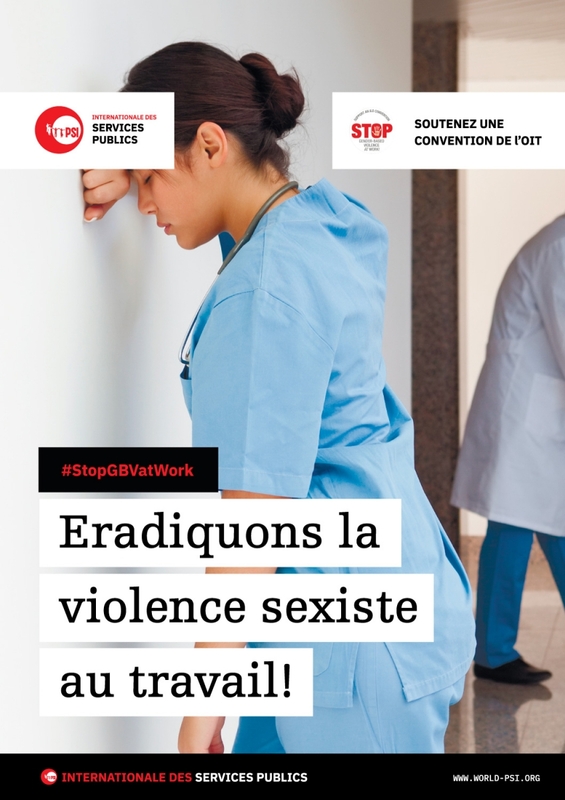 "The Standard Setting Committee: violence and harassment in the world of work" at work saw heated debate, with employers and some governments expected to oppose attempts by unions to push for an International Convention on the subject.